We see so much in the press about getting older which is all doom and gloom. Developing dementia, becoming immobile, being in pain… it’s no wonder that most of the population dread the inevitable coming of old age. However, working with older people day in and day out really does wonders for showing you that, even when life looks pretty bleak, there are still some wonderful happy times to be had. We admire our residents’ positive attitude towards aging and feel honoured to be a part of their journey as they make the most of the time they have. It turns out that staying positive about aging can be more important than we thought, as a new study on aging successfully has gone to prove. A study in the US called the Successful Aging Evaluation Study (SAGE) looked at a group of just over 1,000 adults aged between 55 and 90 years old, although most of the group was over 80. The researchers assessed how successfully these people were aging and asked them questions to judge their mental state too. Interestingly, the oldest people in the group who tended to have the worst cognitive and physical functioning actually scored the highest in terms of their mental attitude towards aging. Overall, the study found that maintaining a positive attitude to life in general greatly increased an individuals chances of aging successfully. Leading researcher, Dr. Jeste, said that this showed that although health can decline with old age, it doesn’t mean we can’t enjoy being older anyway. He claimed that being optimistic, resilient, keeping the mind active, and living in a stimulating environment were all the ingredients required to help people get more out of life as they get older. It’s not the first time that a positive mental attitude has been singled out as being fundamental to a happy old age. In 2016, Psychology Today cited an Irish study into the effects of positive thinking on happy aging, which showed how negative attitudes towards getting older could be linked with frailty and cognitive decline. Other studies have claimed that a positive mental attitude to aging can help older people handle stress better, while another claims it can help seniors heal faster. Whatever you believe, it’s clear that staying positive about the inevitable fact of age can only be a good thing for all of us. Staying active: Physical activity helps us stay well and feel good in general. We encourage our residents to take part in exercise, as well as getting plenty of fresh air. Brain training: Engaging in challenging activities helps the brain to maintain neural pathways and build new ones, so we regularly introduce new ideas, activities and tasks to keep that grey matter busy. 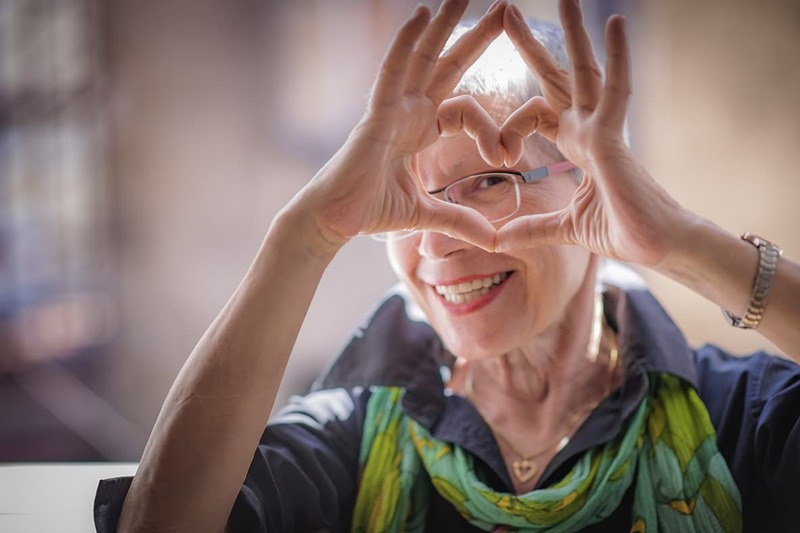 Personal connections: Having genuine, valuable personal connections is incredibly important to self esteem and happiness, so we work hard to help residents forge friendships and to have meaningful interactions in their home. Being useful: Feeling that there is a purpose, a usefulness to us, is crucial to mental wellbeing. For this reason, we get residents involved in tasks around the home, allocating them things they can do comfortably which are genuinely helpful for all of us. Sharing a laugh: Laughter has been shown to bring people closer together, to relieve stress and to help us stay positive about life in general. We try to laugh as often as possible along with our residents, keeping spirits high and making every day fun. We truly believe that having a glass half full attitude to aging can be a powerful strategy. We love to see our residents smiling and having fun and work hard to ensure it happens every day. Come and see our happy, positive environment for yourself; just ask a care worker about coming in for a visit.